From 11-13 November 2015, CMC returned for the third year in a role as exhibitor at the FHC trade show in Shanghai, China. The specially designed corner booth located near the main entrance attracted a lot of visitors among those who came to the USA pavilion. Ones who scanned the QR codes to follow CMC official Weibo and Wechat, or presented their name cards were each given a free cranberry sample pack. There were more visitors from second/third-tier cities this year. Their awareness of cranberries was generally lower than those from tier-one cities. FHC was a good opportunity to let them know about U.S. cranberries. MZMC staff at the booth put in extra efforts to explain to these visitors the unique health/nutritional benefits of cranberries and offered to them samples and CMC flyers. Dried cranberries are mostly consumed as snacks and selling well both traditional retail outlets and B2C (Business to Consumers) e-commerce platforms. The last couple of years saw their increasing popularity as ingredients in baking – for breads, cakes, and cookies. This is one of the factors contributing to the growth in demand for the fruit in China. 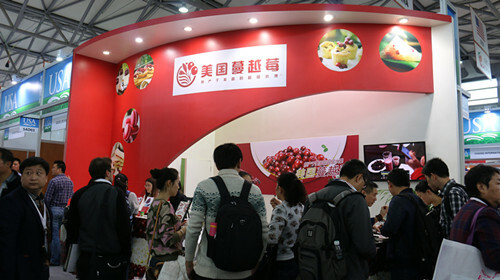 Cranberry distributors who visited the CMC booth stated that they have been satisfied with the market performance. Some even indicated their intention to import cranberries directly from U.S. in the near future. Visitors from restaurants, hotels and bars generally liked the natural red color and the unique sourness of cranberries. They were more interested in the various applications of cranberries, both dried and frozen. Some have already been using different forms of cranberries, including cranberry juice, to make foods and beverages. During the show, MZMC staff also talked to people in the trade to solicit inputs on promoting cranberries juice concentrate. Their initial suggestions included participating in relevant trade shows and collaborating with manufacturers to develop new cranberry beverages. The 2015 FHC represented the show’s 21st year in China (19th in Shanghai). 2400 exhibitors from 66 countries and regions participated in the show. Statistics about visitor numbers would be furnished once released by the organizer. 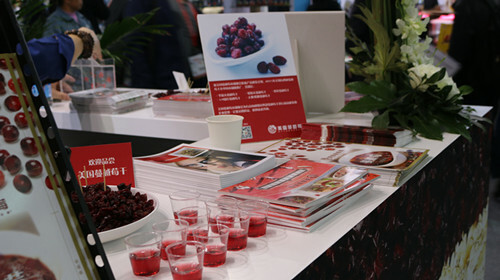 Approximately 3,200 copies of various U.S. cranberry brochures were distributed at the show, 8 relevant trade leads were generated, and 208 business cards were collected.